Sorry for the couple of skipped weeks so quickly after coming back, folks! I’ve been having some computer issues (when it rains it pours, eh? 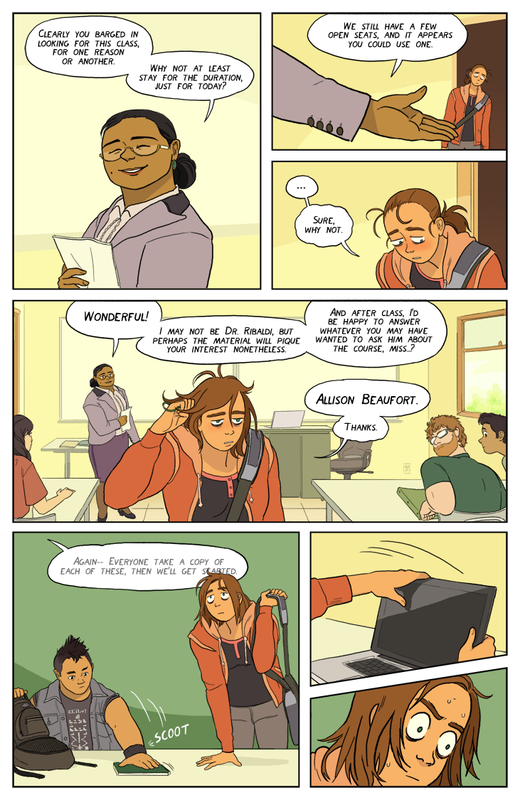 ), so I’ve been making Allison’s face in the final panel quite a bit recently. Calling it now, she just saw Nosilla’s face in her laptop’s reflection. I’m going the other way. Nosilla broke Allison’s laptop during last night’s rampage. Cue head-to-desk. W-w-w-waaaait a second! Everyone in the class looks totally normal! No fur, no scales, no nothin’. Either heavy exercise is the (temporary?) cure to Whatever’s-Going-On Syndrome or there really IS something special about this class! D’oh! It’s been so long since I’ve read the first chapter I forgot it’s not an all-the-time thing. Well, now I feel like a silly-billy. It seems to happen when she can see Nosilla. Nosilla disappeared. Thus, no muppety men. Oh that’s right, Nosilla attacked it on page nine. I figured it broke overnight. Hooray! I’m so glad to see your comic coming back and I hope your computer issues don’t resurface. I haven’t commented yet, but I wanted to let you know I love your comic: the colors are wonderfully expressive, and of course the characters and designs are stunning. Ho-hoooo, glad somebody recognized it so quickly! Did that guy just manspread his school supplies???? @msouth Did you just use “manspread” unironically? You too, eh? Today the thought occurred to me that the RSS had broken. Alas. Hey guys…I’m really sorry for my extended absence of late. Things have just been kind of a mess these past few weeks; continuing computer issues, plus my grandma was hospitalized some weeks back and I had to take some time off to go visit her. Thanks so much for everyone’s patience, though, I’m aiming to have the new page up tonight if possible. I hope your grandmother gets better soon! Sometimes, it doesn’t rain but it pours. Not to pressure you, Suzanne, but I’m looking every day now! I do know that life can screw up the best of schedules and intentions. Just wanted you to know, ya got me hooked! Thank you Bobbie! I’m sorry for making you wait, it won’t be much longer! Fantastic comic, looking forward to reading more!